Are you a fan of pie or cake? I’m more of a French Fry girl myself :) but if I’m choosing between cake or pie, I prefer cake. My husband however is most definitely a pie guy. I found this oh so cute Chantal apple-shaped ceramic baking dish at HomeGoods a couple of weeks ago, the perfect excuse for baking him an apple pie, not that he cares what shape his pie is in . . . he only cares that it’s served with ice cream. I used my favorite cream cheese pastry recipe for a lattice-topped crust, quick and easy to pulse together in the food processor and chill in the refrigerator. You can make it a couple of days in advance and then pull out to warm up 20 minutes when ready to roll out and bake your pie. My ceramic apple dish is approximately 10 x 12 and 2 inches deep, so it’s ideal for a deep dish apple pie recipe. 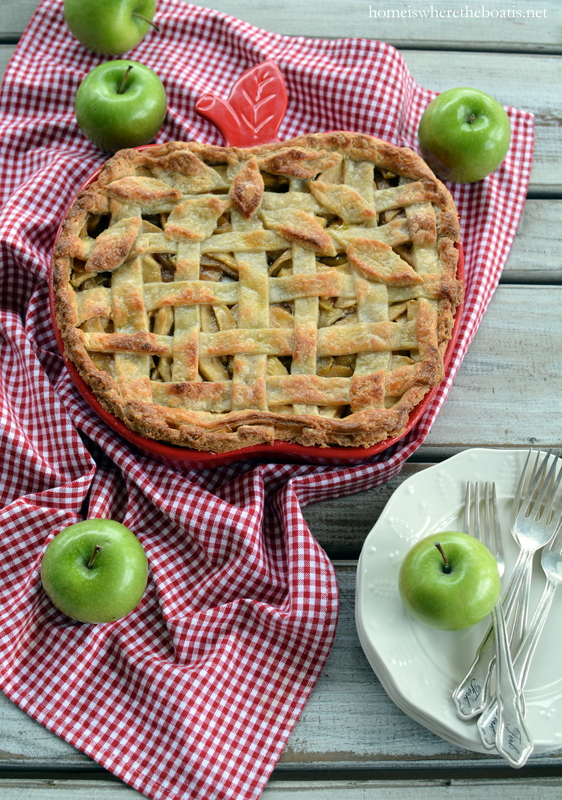 Adjust your filling and apples for a standard size 9-inch pie pan. Pulse all ingredients together in food processor to combine. (If you don’t have a food processor, mix flour and salt in large bowl. Cut in cream cheese and butter with pastry blender or 2 knives until mixture resembles coarse crumbs.) Divide dough into two equal portions and flatten into disks. Wrap tightly in plastic wrap and refrigerate for several hours until firm. Roll out one portion on lightly floured surface to 12-inch circle. Gently press the dough into the bottom and sides of the dish. Trim the edges flush with the rim of the dish. Refrigerate for 30 minutes. 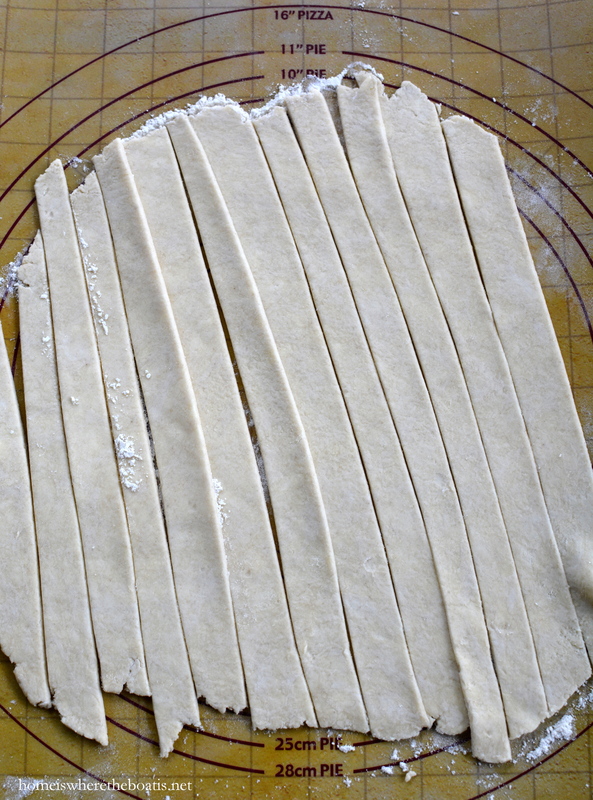 With remaining portion, roll out to circle to width of pie pan and then cut 10 strips of dough in 1 inch wide, (quick and easy with a pizza wheel). Using a paring knife or leaf-shaped piecrust cutter, cut out leaf shapes from the remaining dough. Refrigerate the lattice strips and leaf cutouts until ready to use. 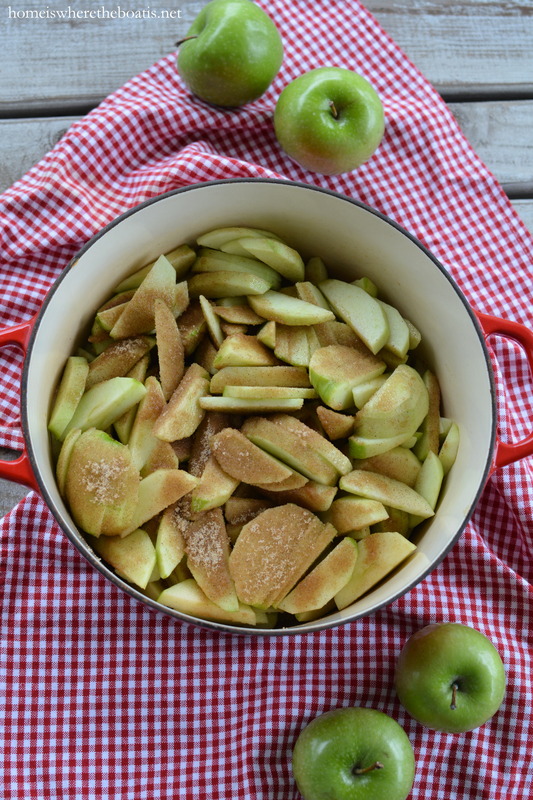 In a large Dutch oven, stir together the apples, brown sugar, granulated sugar, cinnamon, salt, nutmeg and cornstarch. Set over medium heat, cover and cook, stirring occasionally, until the apples are just tender but not mushy, about 15 – 20 minutes. Uncover and cook until the liquid has thickened and become glossy, 3- 5 minutes more. Remove from the heat, stir in the lemon juice and let cool to room temperature, about 30 minutes. 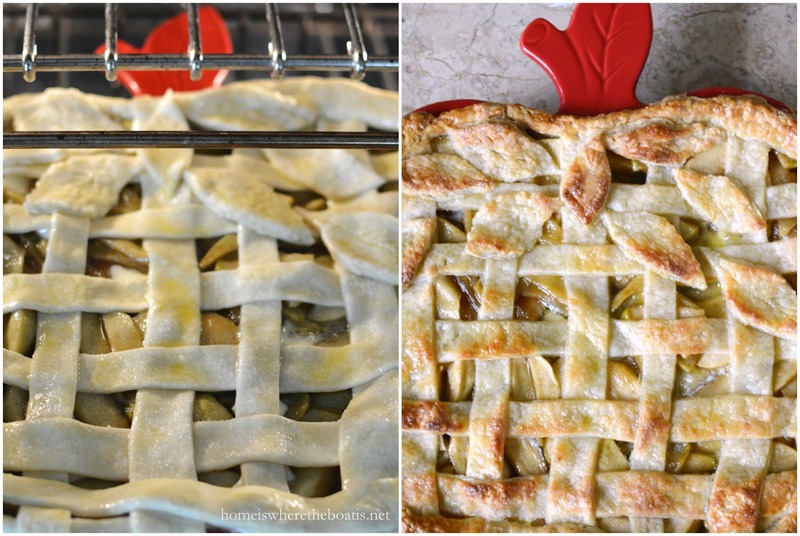 Let the pie shell, lattice strips and leaf cutouts stand at room temperature for 5 minutes.Transfer the apple filling to the pie shell and scatter the butter pieces on top. To create the lattice, lay 5 strips of dough spaced evenly apart on top of the pie filling. Fold back every other strip halfway and lay down a strip perpendicular across the unfolded strips. Repeat to place 5 strips of dough evenly across the top, folding back the alternate strips each time. Pinch the lattice strips onto the dough on the rim of the pie dish to make sure they bake together. Brush the underside of the leaf cutouts with egg wash and gently press them onto the piecrust as desired. Place the pie dish on the preheated baking sheet. Bake until the crust is crisp and golden brown, about 1 hour. Transfer the pie to a wire rack and let cool for at least 1 1/2 hours before serving. Serves 8 – 10. If you’re in the mood for a sweet and savory hand pie, help yourself to Apple, Gorgonzola, and Thyme Pies. Or and an easy Apple and Honey Galette with Brie and Pomegranate Seeds. 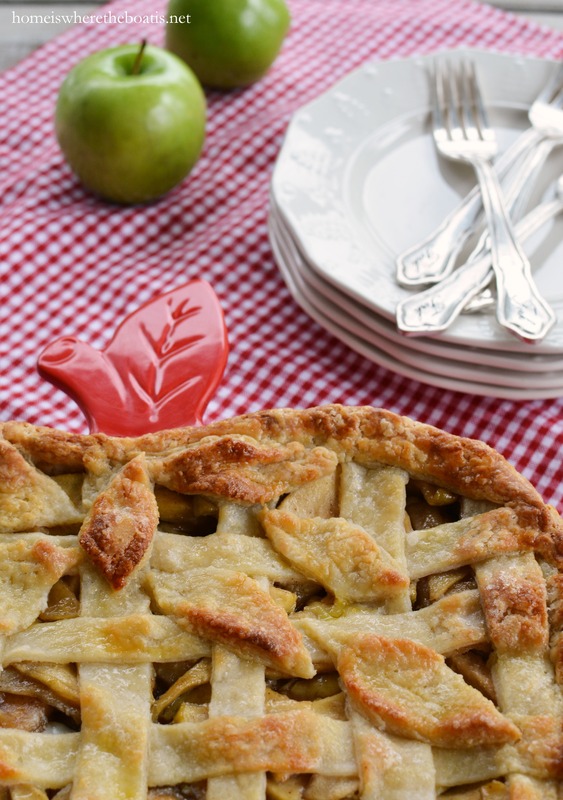 Oh what a beautiful pie, apple is my favorite, and I love the apple dish. I’m betting all this rain is helping the lake. Have a great weekend. I’m a pie person myself and this recipe certainly looks divine. I’ve always wanted to create one from scratch (especially now that I’ve gone apple picking) but always find the lattice-top to be daunting. 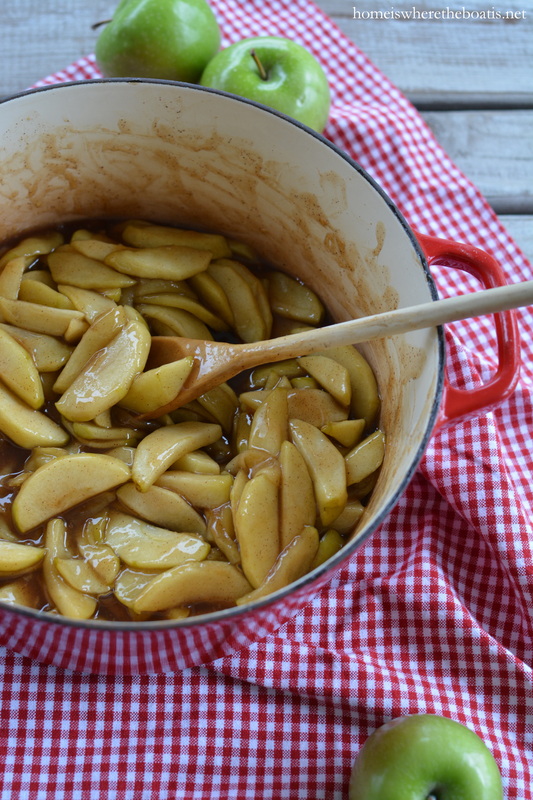 I appreciate your step-by-step guide and adore the apple baking dish as well! This looks and sounds delicious! Your posts are so impressive! I am making apple crisp on this rainy, windy, and floody,<–not a word, but flooding all around us, day. Oh definitely pie for me, Mary, although I do like cake and fries (sweet potato), too!! Your new pie dish is wonderful and I’m sure your hubby was happy that you made him an apple pie. I love how you made the leaves cascading down from the stem, and also, that the filling is pre cooked before baking, which would make the apples nice and tender. 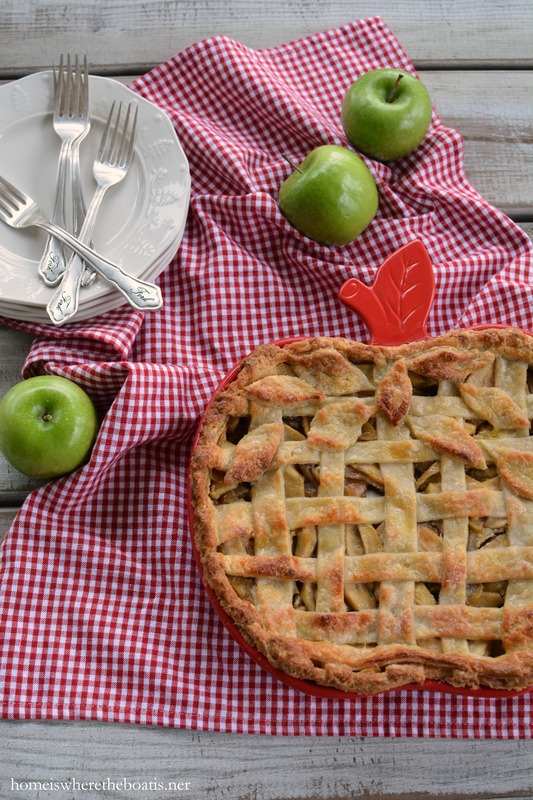 Now I’m wanting to make an apple pie…thanks for the inspiration! I can’t wait to try this recipe. I’m a pie person myself but I will say, your pumpkin chocolate harvest cake with bourbon pecan glaze is outstanding. I highly recommend to anyone reading this that you give it a try! Most definitely PIE!!! I love it, always have. 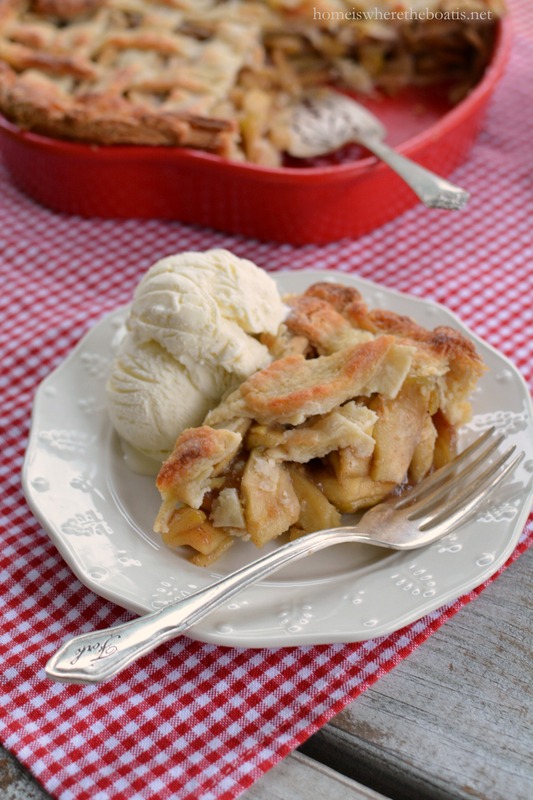 Your apple pie looks delish! This looks so appetising, I think you make it all look so easy and lovely by the great photos you take. Much enjoyed, thank you. My mouth is watering. 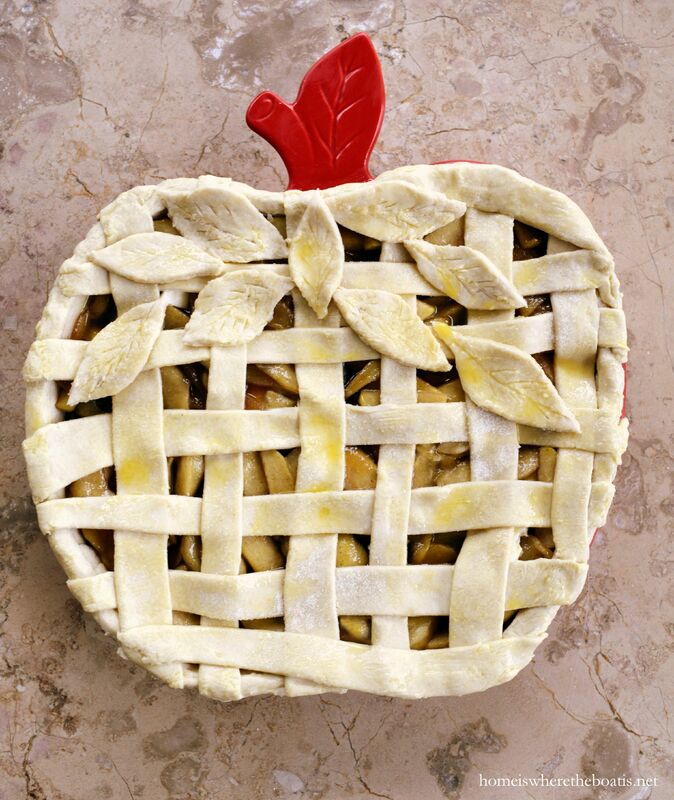 Your pie is so pretty and has to be excellent with such yummy ingredients. The pastry sounds divine with cream cheese! The pan is too cute. I pick cake over pie , Love Wedding Cake ohh yum !! But must say your apple pie looks very wonderful and the crust I would like to try for sure! Any potato will work for me – ha, but I enjoy pie and then cake. The cream cheese crust sounds SO good! I really want to try your Easy Carmel Apple Bars also – shoot their goes the diet! 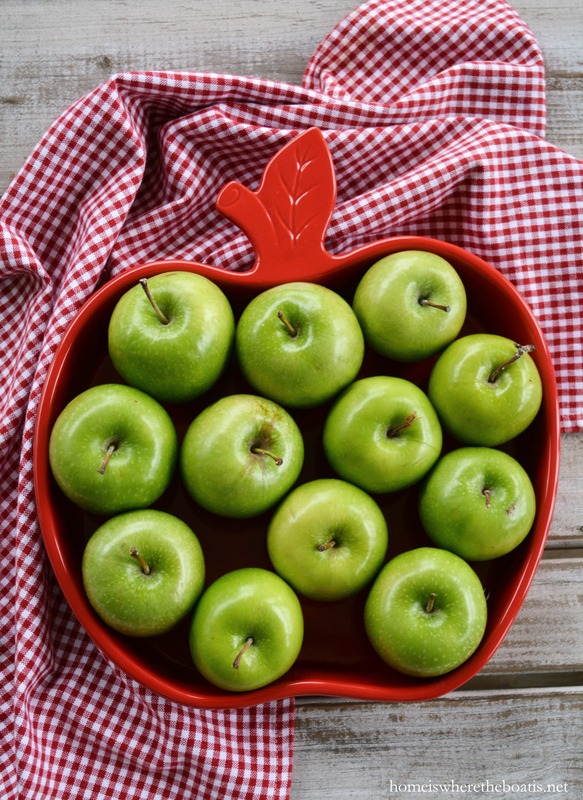 Have you ever tried Honeycrisp Apples? Do they have that variety down south? I just LOVE them, a little pricey, but so worth it. Your creativity and energy is amazing and inspiring! Too funny. 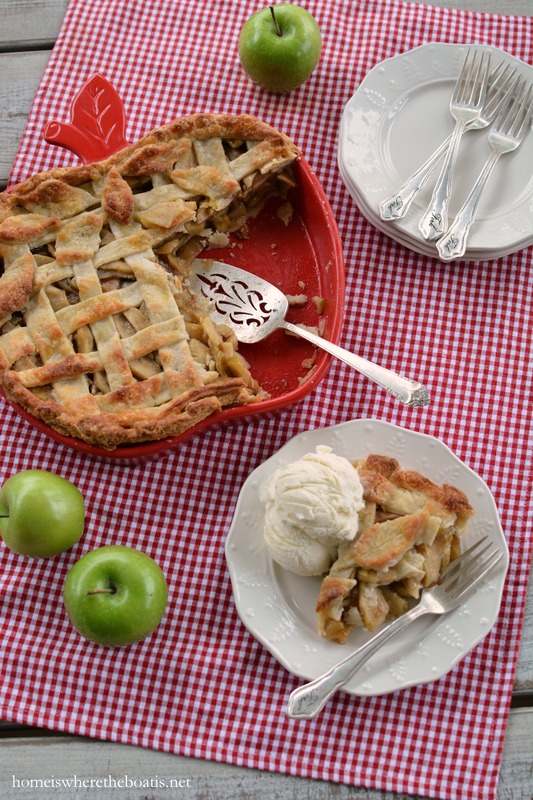 I had my hands on that apple pie dish myself, at Homegoods a few days ago. It’s quite heavy. Had to pass, I had way too many goodies in my cart already. Can’t wait to try this recipe. 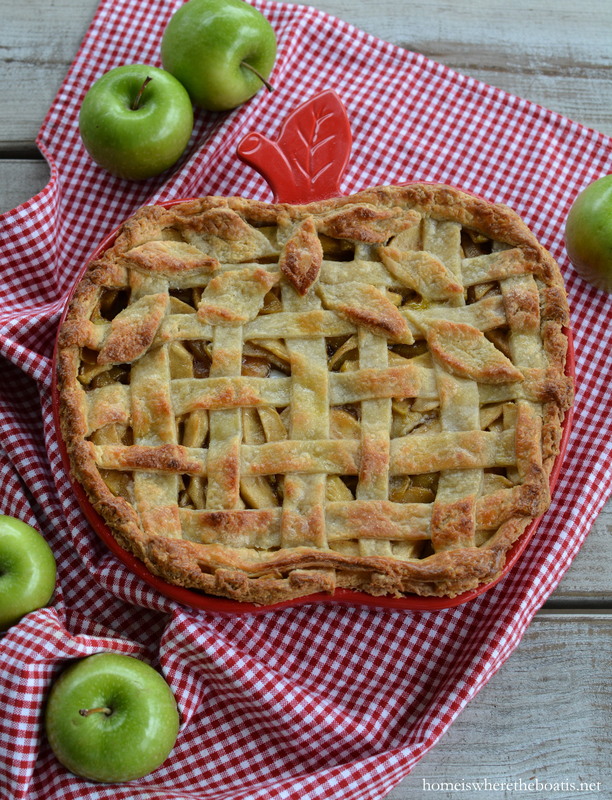 The perfect pie for Autumn–warm and cozy and delicious! Like all 3–my husband makes apple pies for the holidays. Hope you aren’t getting too much rain. It is needed and will be beneficial. Are you OK? Worried about how close you are to the water! HOPE YOU’RE STAYING HIGH & DRY!